This is an interesting photo, as are all of them. Why? Ask yourself is a picture worth a thousand words? I think this one is. What is the significance of 2:55? PM? AM? Is the clock working? 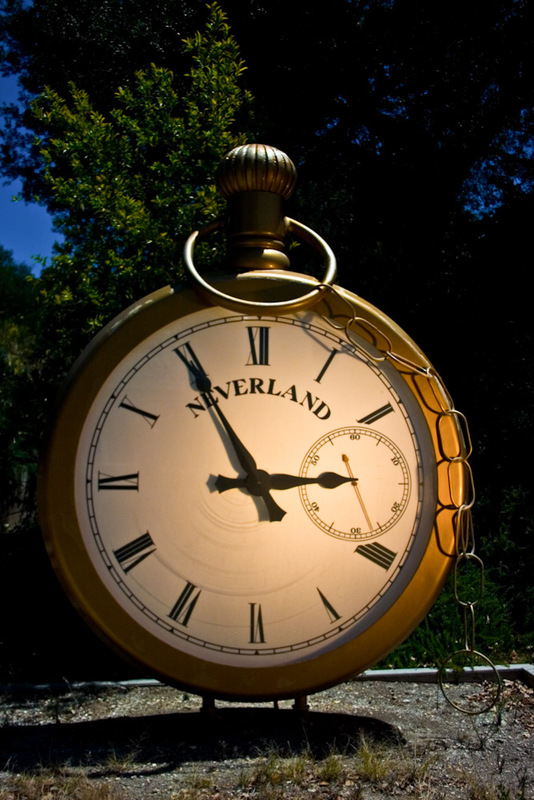 Or, does it signify the exact time of the downfall of Neverland and Michael Jackson? Is this the exact time they pulled the plug on everything Neverland and sent it to the past? So much interpretation can be made from this photo, and all of the others. I feel a sense of history; when things were going great for MJ and Neverland was an escape for him and all who enjoyed the invitation to visit. I understand now, why he left Neverland and never wanted to go back. It was tainted, tarnished and Neverland no longer held the magic he so longily wanted and tried to create. You can FEEL that in these pictures. The magic is gone, and with it, the creator, too. It is, asif, you closed the doors to Disney World(tm) and then returned 20 years later and took photos. Somewhat haunting and very sad, regardless as to how you feel about Jackson. Too bad for him. His actions spelled his doom! OH No my doubt is turning to being sure , are you ok Miss Kathy ? you sure need to visit a psychologist !